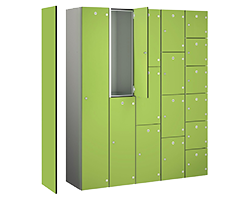 The Elite Two door lockers provide 2 individual compartments with a coat hook for hanging coats and garments. Next Day Delivery is available on selected products and at additional cost - see Express Delivery Items. Please review our Delivery Terms before you place your order. If you are looking for replacement locks or alternative lock options, please review our Elite Locker Accessories category.